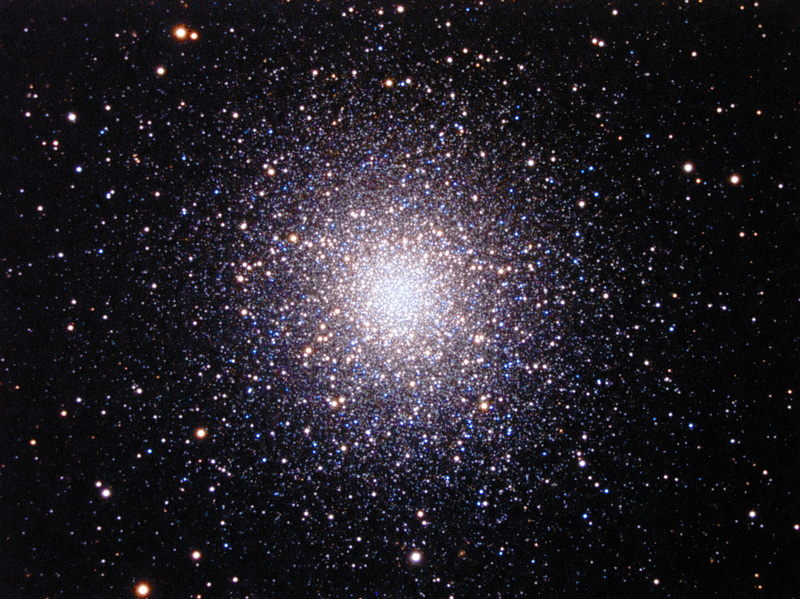 Globular clusters are highly compact star clusters containing hundreds of thousands or even millions of old stars. The stars found in a globular cluster can be up to almost 13 billion years old, and thus act as good tracers of the early history of our Milky Way Galaxy, or of other galaxies in which they are found. Our Galaxy has about 150 or so globular clusters, and our neighbor the Andromeda Galaxy has over 500. Because they are so compact, they are tightly gravitationally bound, and tend to be very spherical, hence the description as globular. They also orbit our Galaxy in the halo and in various directions; they are not confined to the disk where most of the other stars of the Milky Way are found. This suggests a history for globulars (as they are also called) that predates the formation of the Milky Way’s disk and spiral arms. Many globulars may be remnants of dwarf galaxies that have been pulled into the Milky Way during its long lifetime, or have been captured by the Milky Way as it consumed another, smaller galaxy in its vicinity. The large majority of globular clusters are thought to contain little dark matter. They contain no dust or gas, their matter appears to be all in stars. Astronomers are able to measure the mass of globulars by determining how fast stars are moving around in the core, and by measuring the size of the globulars. Assuming the globulars are gravitationally relaxed, which most appear to be, then the mass within a certain radius is proportional to the radius and the square of the velocities of stars relative to the globular’s center and within that radius. Some assumptions need to be made about the falloff of matter density, and projection effects corrected, but these can be calculated and compared with observations to provide a self-consistent model. Going through these steps, and also measuring the absolute brightness of the globular (which requires a distance measurement) allows something called a mass-to-light ratio for the globular to be determined. This is stated in terms of solar units, i.e., using the mass in relation to the Sun’s mass and the absolute brightness in relation to the Sun’s luminosity. Typical mass-to-light ratios for most globulars are of order unity, say 1 or 2 or 3. This indicates little dark matter is present (we know the dark matter content of ordinary stars such as the Sun is low). But now some possible dark matter-containing globular clusters have been found. To be more precise, some globular clusters with quite high mass-to-light ratios have been found around Centaurus A.
Centaurus A is a peculiar galaxy about 10 million light-years or so away, and is the fifth brightest galaxy in the sky by apparent magnitude. It is classified as a giant elliptical, or lenticular, galaxy with peculiar characteristics. It has a very prominent dust lane through the center as seen in the photograph above, and also possesses a large relativistic jet visible at radio and X-ray wavelengths. There is a black hole at the center of Centaurus A with a mass of over 50 million solar masses. Centaurus A may have as many as 2000 globular clusters. A study of 125 of the brighter globular clusters in the Centaurus A galaxy, by Matthew Taylor and co-authors, was made at the European Southern Observatory’s Very Large Telescope in Chile. The locations of the globulars are indicated in the green, blue and red circles superimposed on Centaurus A’s image. A certain fraction of the globulars with masses above a million solar masses showed the characteristic that the mass-to-light ratio was abnormally high, and becomes higher nearly in proportion to the mass of the globular. This set of globulars is denoted in red circles in the image. The most massive of the red circle globulars have the highest mass-to-light ratios. The authors find, quoting from their paper, “a distinct group of objects which require significant dark gravitating components such as central massive black holes and/or exotically concentrated dark matter distributions.” These objects have mass-to-light ratios above 6, and half a dozen have mass-to-light ratios over 15, including one object with a very high ratio of 67. Several explanations are proposed. One is rotation of the globulars in question, but the authors are able to rule this explanation out since the stability of the cluster would be destroyed. Another is massive black holes in the centers of these globulars. This would require black holes with masses in the range 40,000 to over 1 million solar masses, and would be quite an exciting finding in its own right. There is evidence for intermediate mass black holes in a few other globular clusters found in the Milky Way and other galaxies. An additional possibility is the accumulation of many smaller stellar-sized black holes and/or neutron stars in the center of the cluster that would modify the cluster’s dynamical properties. Yet another possibility is the presence of significant dark matter. If verified there would be important implications for globular cluster formation histories. This study should lead to a rush for other observations to ferret out high mass-to-light ratio globular clusters and to allow astronomers to distinguish between the black hole, dark stellar remnant, and dark matter possible scenarios. Already there is a Wikipedia entry for “dark globular clusters”. This entry was posted on Tuesday, May 26th, 2015 at 10:13 pm	and tagged with black holes, Centaurus A, Dark matter, globular clusters, neutron stars, Very Large Telescope and posted in Dark Matter. You can follow any responses to this entry through the RSS 2.0 feed.